CPE Writing Critique and Correction Service! "I worked with you when I was studying my CAE and you helped me so much, that when I decided to study for the Proficiency level I didn’t hesitate to practise my writings with you. Thank you for everything and I am very happy to practise my English skills with you again." Over the years that we've been running Flo-Joe we've had many requests from exam students asking us if we can mark their written work. It's always pained us that we've had to say no, especially as we KNOW how important feedback is as part of your exam preparation. How can I stop making the usual mistakes? How far does my writing meet the exam criteria? "I just wanted to let you know that I have passed the CPE exam with a grade B and I would like to thank you for your help. Your writing corrections have been really useful and meaningful to me and I will definitely recommend your services to anyone wanting to take a Cambridge Exam." "I passed my CPE exam at Grade A, which would have been unachievable without regular practice and guidance provided by Flo-Joe's Writing Critique and Correction Service." For a while now we - that's Fiona and Peter - have been talking about how we can meet this need. And we think we've come up with a solution. We've decided to offer a paid-for Critique and Correction service, but to a limited number of people and only for a trial period. We're restricting this service to Exam Success Plus customers only. We think that's a good idea because a) you know us and hopefully like our resources and b) you're serious about your studies. "I took the exam a month ago and have only just received my results. I passed with Grade A, with a total average of 223 out of 230 points. I cannot tell you how happy and relieved I am and I can barely believe my luck of having passed with such a good mark! My score in writing was an unbelievable 223 and I am sure that I would not have gained such confidence in writing, had it not been for your correction service. Thank you very much for the support you have given me, it was definitely worth it! I would definitely recommend Flo-Joe to others who are preparing themselves for the CPE." IS YOUR WRITING ON TRACK FOR SUCCESS? By studying our weekly writing tasks and writing criteria, you'll know there are several boxes you need to tick to get that top grade you're after. However, if you're working alone without the support of an experienced, qualified tutor, getting a measure of how well your writing meets these criteria is difficult. If you find yourself in this situation, our Critique and Correction service could be just what you're looking for. "I have just learnt my results. After examining the statement of results, I could verify that my highest performance was in the writing part of the exam, qualified as exceptional and that is thanks to your Writing Critique and Correction service which is more than exceptional. So, you cannot imagine how much I appreciate your invaluable, professional help. Needless to say, I will recommend all of your services to those people who want to succeed in this kind of exam." As you know, there are 13 writing tasks in a complete Series of CPE Exam Success Plus. You can choose to sign up for Critique and Corrections of 1 task, 3 tasks or the full 13-task service. For our 1 or 3-task service you choose the writing task(s) you wish to try from the Exam Success Plus Series you are subscribed to and email us your finished pieces of work. The 13-week service will allow you to have every writing task in Exam Success Plus critiqued and corrected. We advise you to send each piece of writing to us separately. This will allow you to learn from and repair any problems with your writing before submitting your next piece to us. your writing returned with the type of errors highlighted (WO: Word Order, WT: Wrong Tense, etc.). This will give you a chance to correct your mistakes before we correct them for you - a good learning opportunity! advice on which areas of English you need to practice, categorised as language you 'must' revise, language you 'should' revise and language you 'could' revise. Content, Communicative Achievement, Organisation and Language. Please note: we do not grade your work A, B, C etc. as this is something that can only be done legitimately under examination conditions by a team of assessors. However, we will be able to tell you whether we think your work is of the standard we would expect from a student working towards the CPE examination. Click the image or link below to see an example of what you will receive. This is a PDF file. 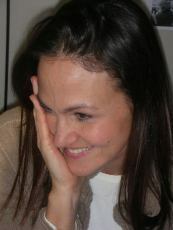 "I'm so delighted to tell you that I passed my CPE exam! Now I'm finally able to finish my studies and become an official teacher of the English language. Thank you for your feedback and encouraging words. 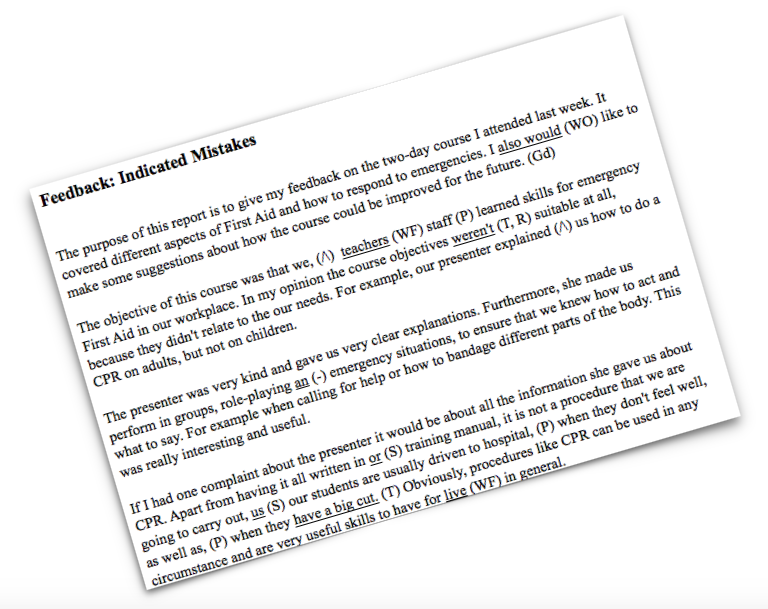 I would certainly recommend the writing Critique and Correction Service to all my fellow students." "it is really an excellent service ... 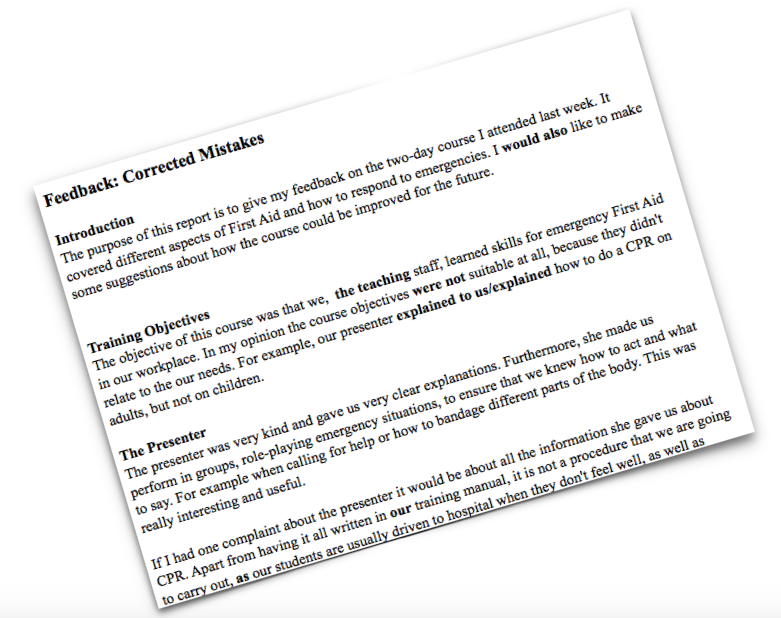 I must say it is excellent"
Read our feedback based on the CPE Writing criteria for a general overview of your progress. Read our feedback on the areas of English we feel you need to improve. reading through the corrected piece of work and comparing our suggestions to your own self-corrections. Working in this way will give you a second chance to 'get it right' before looking at our corrected version. AND ... with the awareness of the areas of English you need to improve, you can focus on this when doing your next piece of writing. "After several months of studying with Flo-Joe, I've got "B" grade for the CPE exam! The Writing Correction service helped me improve my skills and gain confidence. Even when I found out that the exam texts and topics were not exactly "mine", I knew what to do! Thank you very much indeed!" Okay, so what’s the cost? We appreciate that some students may only want a snapshot of their writing whilst others may prefer the comfort of knowing how well they are doing in all tasks. We therefore have three subscription options. 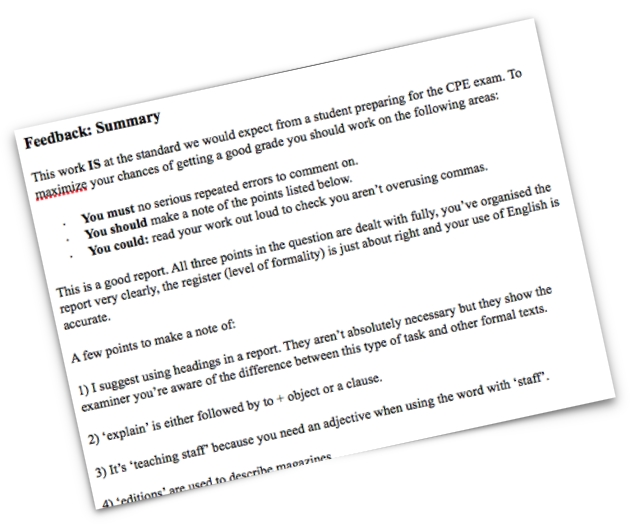 1) you can sign up for our Critique and Correction service for 1 Exam Success Plus writing task. 2) you can sign up for our Critique and Correction service for 3 different Exam Success Plus writing tasks. 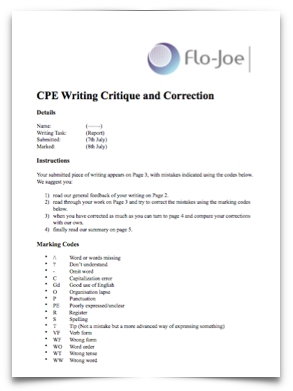 3) you can sign up to our Critique and Correction service for all 13 tasks in CPE Exam Success Plus. We do our utmost to return your writing tasks within 48 hours (not including Sundays and Bank Holidays). Sign up for our CPE Critique and Correction service, and get ready for the CPE challenge! P.S. Just remember: with motivation to go the extra mile, exam success can be yours! Get started with our CPE Critique and Correction service using our secure online payment system. "Thank you very much for all your help! Without it I wouldn't have managed the writing part at all. It was extremely helpful to get (again) into the habit of writing essays, reports etc and your comments have always been useful. I was a bit sceptical when I first signed up but my expactations have been highly exceeded. I would definitely recommend Flo-Joe and will come back to your service whenever I need to brush up my writing!"